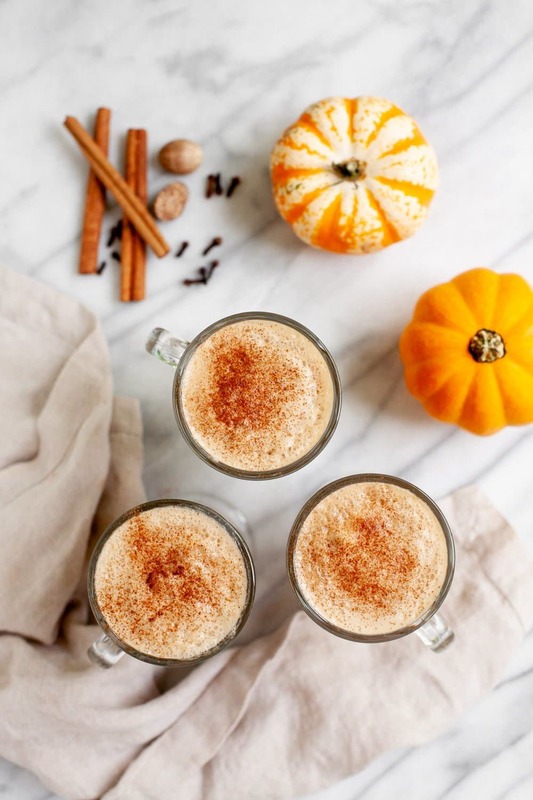 This Vegan Pumpkin Spice Latte is plant-based and uses only unrefined sweeteners. Plus, it *actually* contains pumpkin! Can I confess something to you? I don’t actually like *the* Pumpkin Spice Latte. You know the one from the big name fancy coffee shop that everyone gets all in a tizzy about in early fall? Yeah, I think it’s kinda…not good. Maybe I’m just a coffee snob (totally am), but I think the O.G. P.S.L. has way too many spices that way overpower the actual flavor of the coffee. It’s almost a little bitter, too? And almost chemically? I can’t exactly put my finger on why I don’t like it, I just know I’m not a fan. The interesting thing is, I used to really like PSLs! I used to look forward to them every year. I was one of those run-out-on-the-first-day-they-are-available-and-get-a-venti kinda gals. But then I accidentally ruined it for myself because I started making them at home! I was just trying to save some cash by DIYing them, but an unintended side effect was me realizing I could craft a much more flavorful and interesting drink at home. Pumpkin Spice Lattes from the coffee shop never scratched my itch again! So here is my version of a Pumpkin Spice Latte. It just happens to be plant-based, uses only unrefined sweeteners, and *gasp* actually has pumpkin in it (unlike the one you may be used to). I can guarantee you are going to read this recipe and be all like, “two tablespoons of vanilla? That has GOT to be a mistake.” I promise it isn’t! The rich vanilla flavor is part of what makes a pumpkin spice latte so PSL-y. If you aren’t on the plant-based/decaf train, you can just as easily use cow’s milk and fully-leaded coffee in this recipe. It’s pretty customizable. Just stick to the two tablespoons of vanilla. I beg of you. Enjoy! 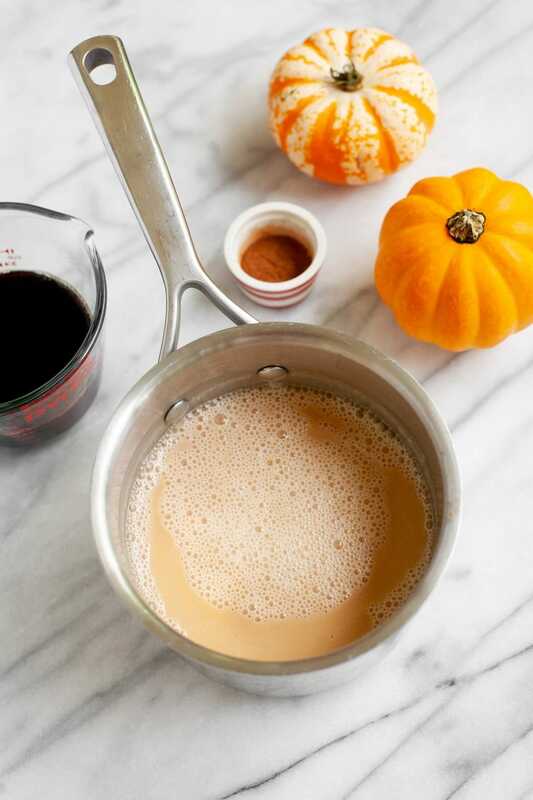 Whisk together the almond milk, pumpkin puree, coconut milk (if using), maple syrup, and vanilla extract in a medium saucepan over medium heat. Heat until steam rises from the edges of the pan, about five minutes. Remove from the heat and stir in the pumpkin pie spice and coffee. Whisk rapidly until the mixture is frothy (or use an immersion blender for extra foam). 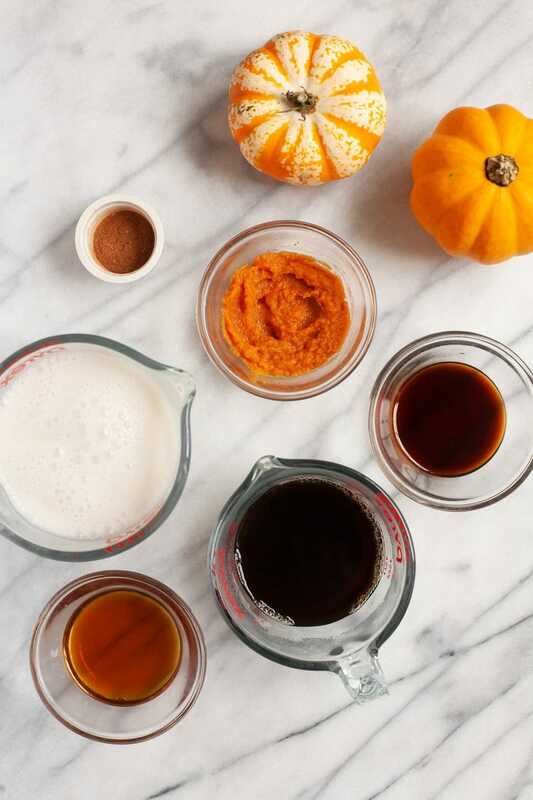 Pour into mugs and sprinkle with a little pumpkin pie spice. Serve hot. Adding coconut milk makes this latte extra creamy and decadent. Using two tablespoons of regular vanilla extract does add some alcohol to this drink. Use an alcohol-free, glycerin-based extract if needed. If you do not have pumpkin pie spice, use 1/4 teaspoon cinnamon and one small pinch each of allspice, cloves, ginger, and nutmeg (or just cinnamon if you’re low on spices!). That looks really yummy, and now I’m going to have to try it. Though now I have to figure out what exactly pumpkin pie spice is so I can make it at home. We make cappuccino every day and on hot days we just turn it into Vietnamese iced coffee. So yummy! I believe that McCormick’s actually makes a spice mix called “Pumpkin Pie Spice”. Yeah, I’ve seen it, but couldn’t remember what was in it. But since we keep all the individual spices at home, it’s easy enough to whip of my own version. I found a recipe at Baking Bites that shows you the quantities, so yay! I don’t usually make fancy coffee at home, but I do want to try this one. I love PSL. This sounds awesome and I LOVE that first photo! Gorgeous staging. Oh my yum! I’d like to remove cows milk from my diet (lactose issues), but I’m terrified for some reason of non cow milk options. Do you have any non dairy milk guide that you go off of? Like taste, cooking, baking for soy, almond, coconut milk etc. Sweetened, unsweetened. Or do you just wing it and buy a milk that you think you’d like? I just wing it! I really like the taste of almond milk and I don’t eat processed soy, so I used almond milk almost exclusively. I almost always have unsweetened vanilla around for sweet things and some unsweetened plain for savory things. And sometimes we buy a box or two of sweetened chocolate just for a treat! Don’t be scared. Just go out and buy stuff and see which ones you like! ohh thanks for posting this! I would have thought the pumpkin would need to be strained, but I guess not! Probably makes for a hearty thick and delicious latte. 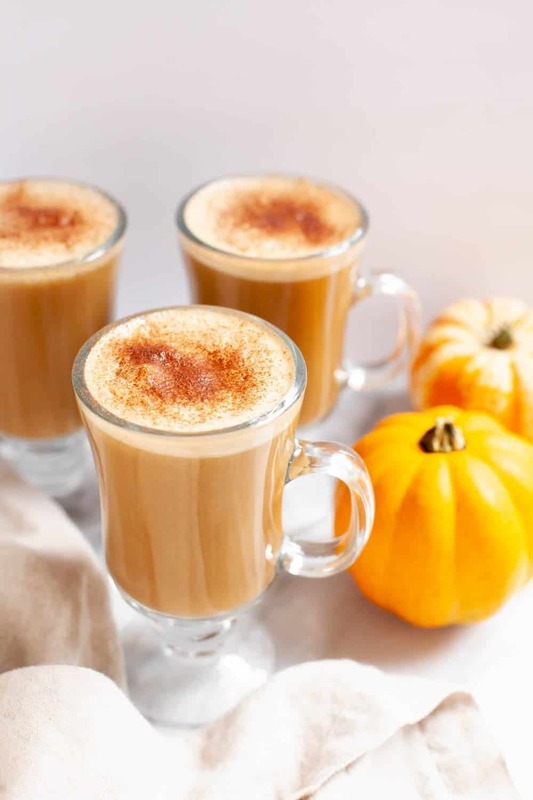 I love the pumpkin spice lattes but I have never made homemade so I think I’ll try this. Sometimes there is nothing wrong with posting a common recipe because not all of your readers navigate the entire blog world you know ;) Some people only follow a couple, so be your own voice. With those two tablespoons of vanilla, it might almost be as expensive as Starbucks! Haha I only buy the real stuff so it could get pricey however I am sure this is worth making at least once this season! :) I will try it. Haha! I buy the real stuff, too. It isn’t that bad because this makes two-three large servings. Which are about $4 a pop at the ole ‘Bucks! I made this this morning——SO YUMMY! Way better then Starbucks for sure! I make them a lot. I have an espresso maker with a steam wand so I make lattes all the time. Plus I worked in a cafe for a while, so there’s that. Absolutely! I used decaf for mine. Thanks for the recipe! I’m actually sipping on it right now. It was the perfect thing to get me up this morning. 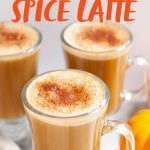 You’re right, there are so many pumpkin spice latte recipes out there, but your recipe is so simple and delicious. Took me about 5 minutes to make. I used an emulsifier at the very end to get it really frothy and to mix all the ingredients. Thanks, Cassie! Oh sweet, sweet latte goodness. I have make sooo many of these now! So absolutely delicious! Just made this! It turned out wonderful. Delicious flavor and easy to make. 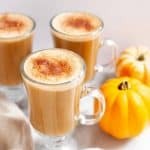 Great at home pumpkin latte! Thank you. I’d love to do this, and definitely will try this weekend. During the week I have to try and get myself and a 3month old out of the house pretty quickly – think this would last ok in the fridge overnight for an iced latte in the AM? Absolutely! You might have to give it a little bit of a shake in the morning, but it should still be tasty. It sounds so delicious~ What a perfect drinks for cold days~ Thank you for sharing the recipe! I can’t wait to try it.